My dominant personality is Sanguine, which means that if you met me you would say that I am an extrovert. I can be loud and funny (sometimes). I am the forever cheerleader – Go YOU! And, I like color – colorful handbags, colorful clothes, colorful home décor…you get the picture! When I prayer journal I like to use colored pens. Every night I select a new color from a repertoire of colored pens that I own. I punctuate some of my entries with stickers, which makes it easier to locate significant notes as I flip back through my structured prayer journal. I like to use colored tabs to easily refer back to important entries. I also like to use my colored pens to make little symbols in my prayer journal. You are apt to see stars, smiley faces and arrows on my colorful pages. These symbols are what I use to express my emotions as a short-hand alternative to free-hand journaling my thoughts. The arrows connect God’s answers and insights to what I am praying about. Often I will circle or underline the scriptures in the headers where God is speaking to me about something for which I am also praying. My prayer journal may look messy, but it makes perfect sense to me, which makes it a BEAUTIFUL MESS! I just know that when God instructed people to “Write this down!” He meant with colored pens! If you are like me, and a prayer journaler, I bet you have your own assortment of journaling “tools”, too. What’s in your toolbox? 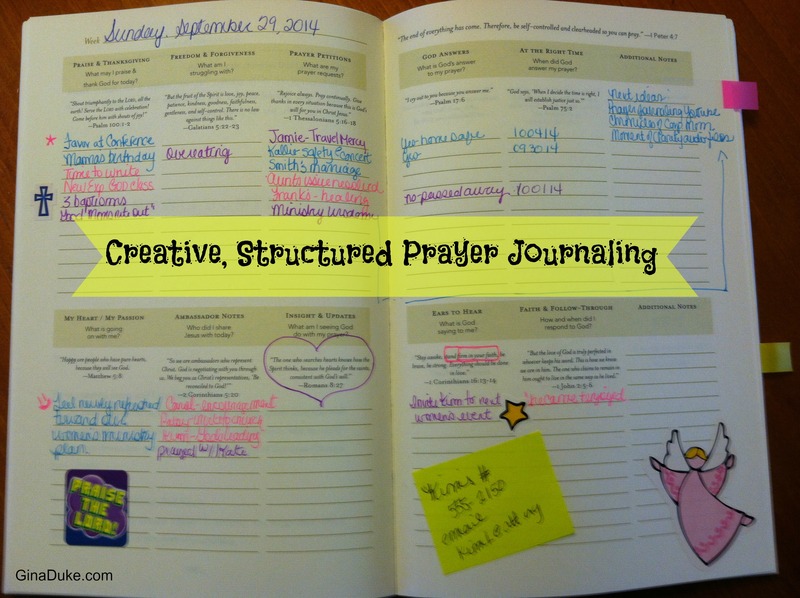 Tomorrow I am going to start zeroing in on each section of the structured prayer journal. If you think Thanksgiving and Praise is a pretty straightforward concept, then think again. I’ve got some scriptures and personal stories that will change everything about how you start your prayers. So excited – hope you come back for that!!! I would like to learn how to journal with color. I jumped for joy when Sharpie came out with their pastel line of pens! PINK! 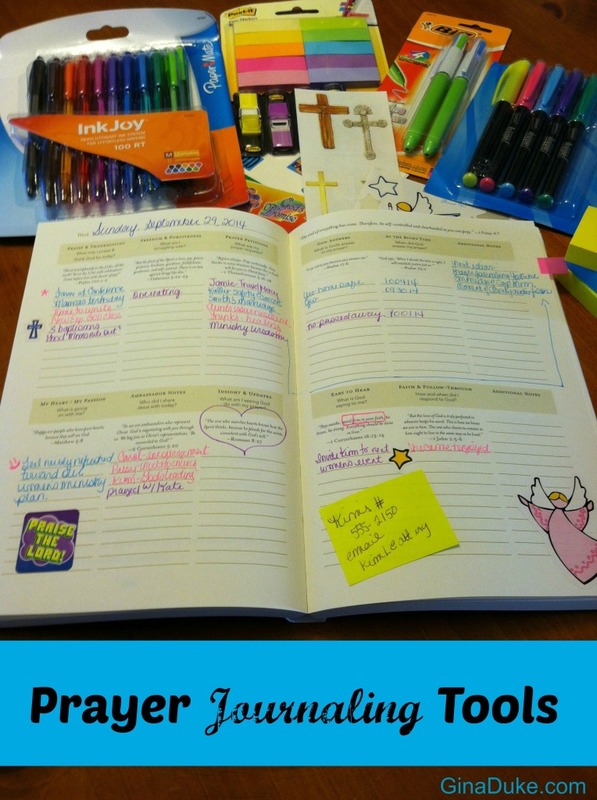 I finally had a pink Sharpie to prayer journal with. I am loving this series, thanks so much for sharing. Gina, I am enjoying your Prayer Journaling series. I found it about a month ago and am just now making my way through the entries. I am so with you on colorful pens. I shouted for joy at your statement …”I just know that when God instructed people to “Write this down!” He meant with colored pens!” I have been using gel pens in an assortment of colors with and without glitter to express myself in my Bible studies and Prayer Journal. My colorful side just has to express itself on the pages of my journal. Thank you so much for your insightful series. Gina, what journal are you using? Do you remember where you bought it? I like the design of your journal. Joanie, HI! I am using Organizing Your Prayer Closet (Abingdon Press). I wrote it. It includes a 60 week prayer journal, which is what I am using. If you go to my home page, you can click on the pages related to my book and fun resources. It is available on Amazon. I hope you enjoy it!